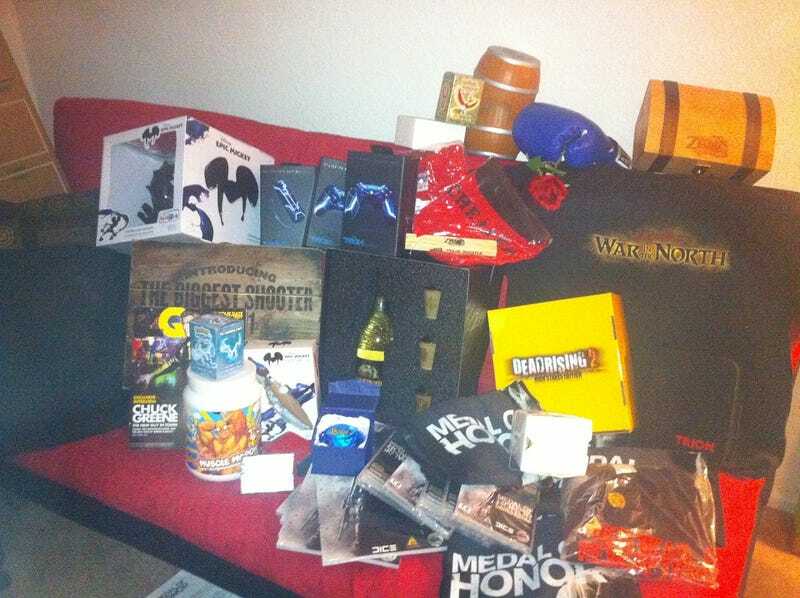 I spent the past week or so going through all of the loot sent me from a variety of video game publishers and developers over the past year. As always, I collect this stuff to give away during a once-a-year fundraiser. This year's fundraiser kicks off on Thursday here in Denver at Cervantes Masterpiece Ballroom. All proceeds will go to the Japanese Red Cross Society to help victims of the earthquake there. Sorry that these aren't the highest quality images, I'm sort of doing this as I'm packing up our house to sell it and then move halfway across the country. The event will feature Rock Band, DJ Hero and perhaps Dance Central up on stage, a full console arcade, a live DJ set, a bazillion door prizes and a pretty nifty silent auction. I also created an event page on Facebook, so feel free to check that out or our previous posts about Thursday's fundraiser here on Kotaku.